Prepare for adventure when "the most original animated film in years" (Bryan Erdy, CBS-TV) that thrilled audiences of all ages drops on DVD and Blu-ray! 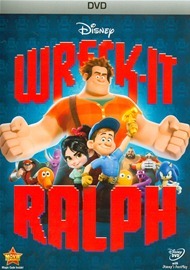 From Walt Disney Animation Studios comes a hilarious, arcade game-hopping journey in Disney's Wreck-It Ralph. For decades, Ralph has played the bad guy in his popular video game. In a bold move, he embarks on an action-packed adventure and sets out to prove to everyone that he is a true hero with a big heart. As he explores exciting new worlds, he teams up with some unlikely new friends including feisty misfit Vanellope von Schweetz. Then, when an evil army threatens their world, Ralph realizes he holds the fate of the entire arcade in his massive hands. Featuring an all-star voice cast and a groundbreaking animated short film, Disney's Wreck-It Ralph has something for every player. Bring home the ultimate reward on Disney DVD and Blu-ray!